Israeli soldiers abducted, late on Monday at night, three young Palestinian men from Jenin, in northern West Bank. 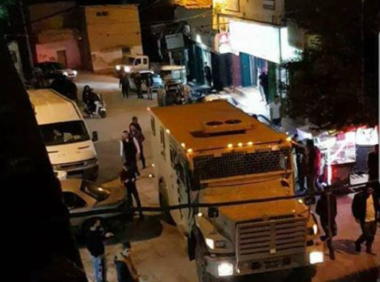 The Jenin office of the Palestinian Prisoners’ Society (PPS) has reported that the soldiers invaded Kafrit village, southwest of the city, abducted Nadim Turkman and Yazan Hamarsha, and confiscated their motorcycle. It added that the two Palestinians are from Ya’bad town, west of Jenin. In addition, the soldiers abducted Mateen Dabaya, from Jenin refugee camp, after stopping him near the entrance of Zabbouba town, west of Jenin. In related news, the soldiers installed many roadblocks in Jenin governorate, especially around Ya’bad and Kafrit towns, before stopping and searching dozens of cars, and interrogated many Palestinians while inspecting their ID cards. In related news, undercover Israeli soldiers infiltrated into the campus of Birzeit University, in Birzeit City, north of the central West Bank city of Ramallah, and kidnapped three students from their dorms.